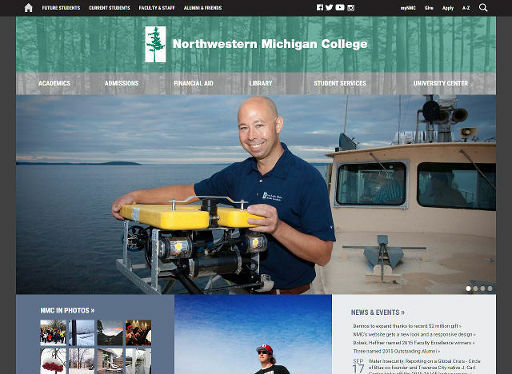 Northwestern Michigan College has launched a new, more responsive website to showcase the college’s major programs and success stories. The site also works better on the wide variety of devices used by today’s students, staff, alumni and community members, including smartphones, tablets and larger computer screens. The new look was designed by NMC’s Public Relations, Marketing & Communications department and developed by Flight Path Creative, which provided technical and implementation services. 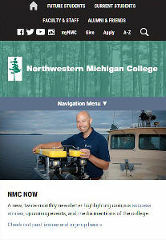 The site’s streamlined home page showcases unique college programs and also features a new color palette more reflective of NMC’s campuses and the natural environment of the Grand Traverse region. The three-month process included focus group meetings with potential and current students, discussing how to make the site most user-friendly for them. 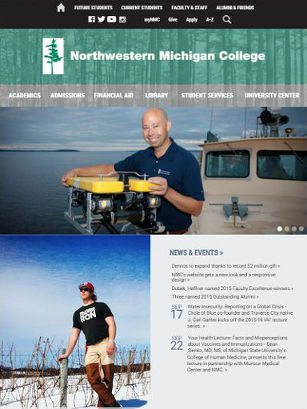 Northwestern Michigan College is a publicly funded community college that serves more than 50,000 people, organizations and businesses annually throughout the Grand Traverse region and beyond. NMC offers associate's degrees, bachelor’s degrees through the Great Lakes Maritime Academy and Great Lakes Water Studies Institute, professional certificates, and an extensive array of non-credit community classes. NMC also is home to the Dennos Museum Center, Hagerty Conference Center, WNMC 90.7 FM Community Radio, and the NMC University Center, whose eight partner universities grant baccalaureate, graduate and doctoral degrees. Flight Path Creative is a full-service brand communications firm based in Traverse City. Flight Path was formed in 2004 by Aaron Swanker and Dan Smith, who combined have more than 30 years of experience serving companies of all sizes. For more information, visit flightpathcreative.com.